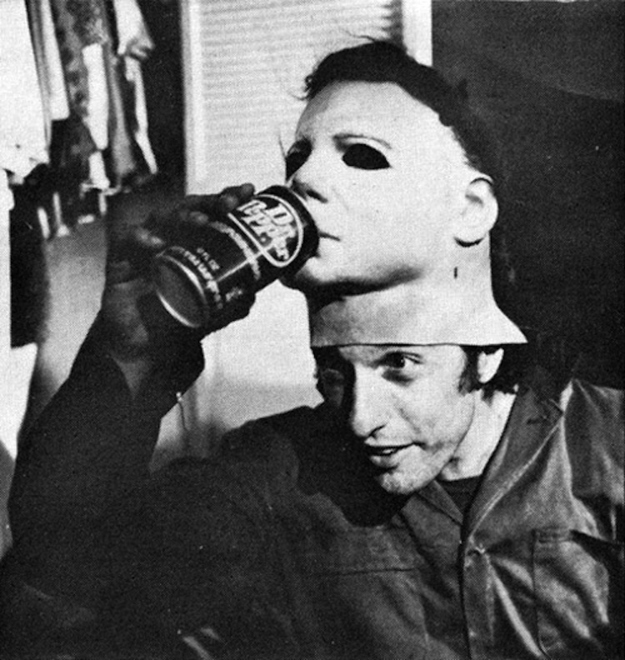 Nick Castle clearly enjoyed Dr Pepper soda. As does Michael Myers clearly. It’s a bit like Kel; “Who loves Dr Pepper? Michael loves Dr Pepper”. Besides this photo being generally awesome it also shows just how well Nick Castle’s face fitted the mask. Halloween 2 would feature the exact same mask from Halloween yet Michael would appear distinctly different. The reason? A different actor, with a different shaped face, beneath the mask. Quite simply, Nick Castle IS the quintessential Michael Myers. Dr Pepper or no Dr Pepper. Most Halloween fans are familiar with the infamous image of Michael, kitchen knife in hand, gazing over the banister seconds after knocking Laurie down the stairs. Here’s John Carpenter directing Nick Castle (behind the mask) in the Doyle house in 1978, probably lining up the shot and the old eye-line. Cramped filming conditions indeed. This photo is the inspiration for this 30 day series. Regular Deadly Movies readers will recognise it from numerous banners and headers over the years. Yet the fascination is not purely aesthetic (but it is very bloody cool). This image taken on during the filming of Halloween (1978) is a strange precursor to the franchise’s history. With no knowledge of the movie’s impending (huge) success, this photo precedes the retrospective history that Laurie and Michael are brother and sister, locked in a never ending cinematic sibling rivalry. At the time this was simply Jamie Lee Curtis and Nick Castle (the man behind the mask) messing around between takes. But in retrospect, isn’t it just amazingly poetic? Check in everyday to see another behind the scenes image from the HALLOWEEN FRANCHISE.